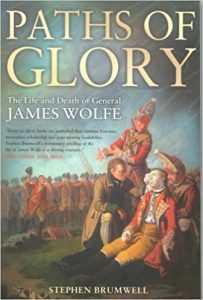 Ugly, gangling, and tormented by agonising illness, Major General James Wolfe was an unlikely hero. Yet in 1759, on the Plains of Abraham before Quebec, he won a battle with momentous consequences. Wolfe’s victory, bought at the cost of his life, ensured that English, not French, would become the dominant language in North America. Ironically, by crippling French ambitions on that continent, Wolfe paved the way for American independence from Britain. Just thirty-two years old when he was killed in action, Wolfe had served in the British Army since his mid-teens, fighting against the French in Flanders and Germany, and the Jacobites in Scotland. Already renowned for bold leadership, Wolfe’s death at the very moment of victory at Quebec cemented his heroic status on both sides of the Atlantic. Epic paintings of Wolfe’s dying moments transformed him into an icon of patriotic self-sacrifice, and a role model for Horatio Nelson. Once venerated as the very embodiment of military genius and soldierly modesty, Wolfe’s reputation has recently undergone sustained assault by revisionist historians who instead see him as a bloodthirsty and priggish young man, a general who owed his name and fame to one singularly lucky – though crucial – victory. But was there more to James Wolfe than a celebrated death? In Paths of Glory, the first full-length biography of Wolfe to appear in almost half a century, Stephen Brumwell seeks to answer that question, drawing upon extensive research to offer a boldly argued reassessment of a soldier whose short but dramatic life unquestionably altered the course of world history.